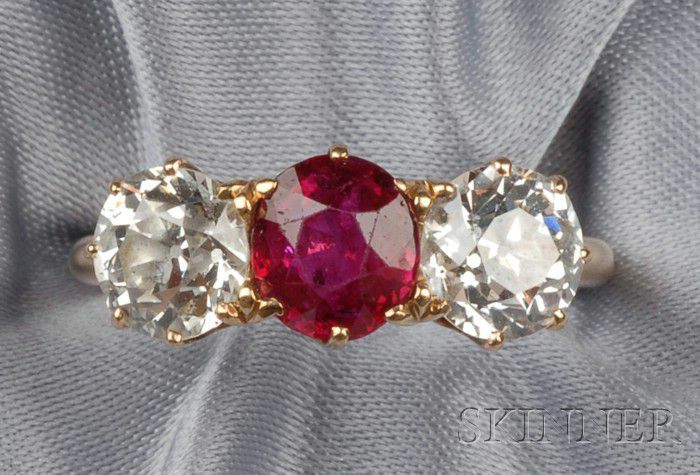 Antique Ruby and Diamond Three-Stone Ring, prong-set with an oval-cut ruby measuring approx. 6.80 x 6.10 x 4.03 mm, flanked by old European-cut diamonds, approx. total diamond wt. 2.00 cts., 18kt gold mount, size 7. 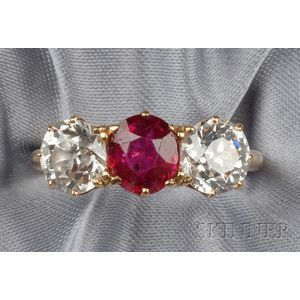 Facet wear to ruby. Lively rich, red color. Numerous typical loupe visible inclusions. Diamonds draw color but are clean and very livley, minor nicks to girdle.